Ancient Blue Cobalt Glass, Jerusalem 100 A.D.
Introduction Atlantean Machines Are Here!!! This combination of radiowave technology, beat-frequency oscillation, harmonic resonance, waveform reduction and electronic biofeedback of the salt-water electrolytic biocomputer (commonly referred to as the "human being") is the registered invention of E.J. Gold, early biofeedback pioneer and author of the 1964 classic, "Alternate Worlds Beyond the Galaxy". The SuperBeacon™ is more than a Beacon™, more than a Zone Box™, more than a Cleanser/Charger, more than a Ghost Hunter, more than a dowser, more than a Spirit Radio and includes all of these. Use the SuperBeacon™ for your Parallel Universe Personae Integrations. Use it for your Zone Box™ Inductions. Put it by your bedside. The Black Tourmalines make for an incredible Cleanser/Charger effect. 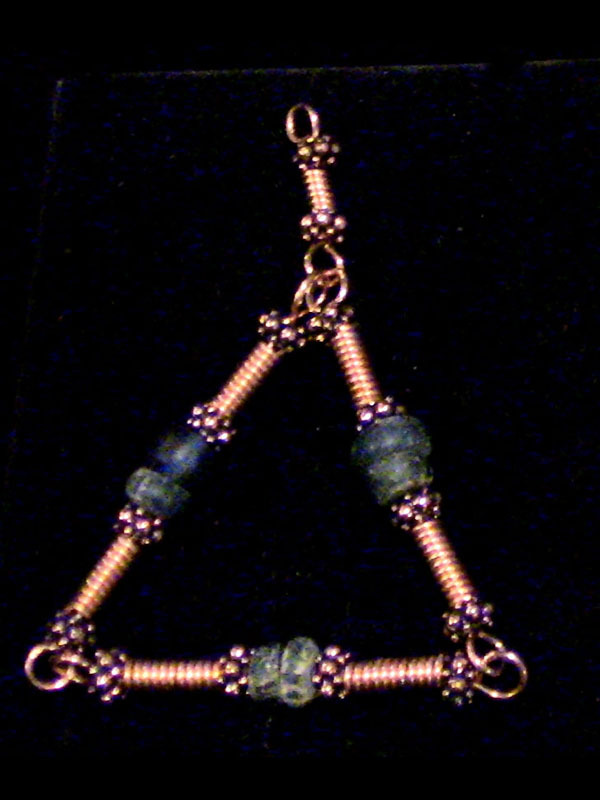 Ancient Blue Cobalt Glass, Jerusalem 100 A.D. with modern copper findings & wire. The double-bead centers were a common theme in many jewelry pieces made from about 1500 B.C. to about 450 A.D. and re-emerged as a popular thematic structure in the jewelry of the Middle Ages in France, Spain, Italy, Germany and Russia.